Scammers Now Target Care.com Dog Sitters! Can you spot the red flags? 2. “hard of hearing” meaning we can’t talk over the phone or over video chat but must communicate via email or text messages. 3. 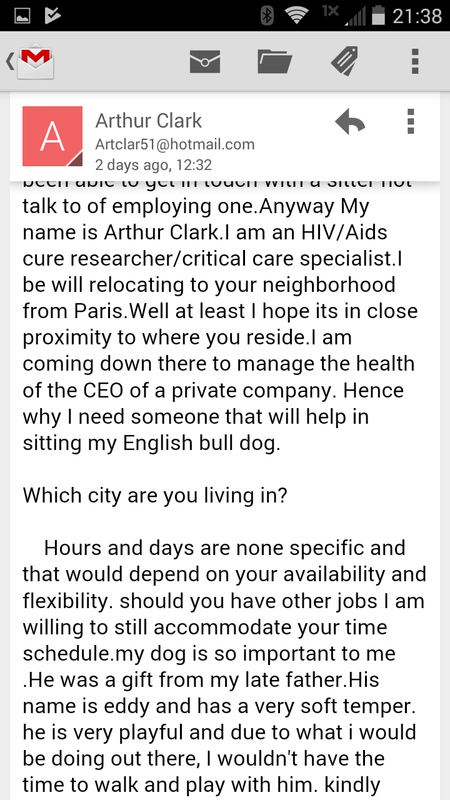 “moving to your area” –Where is MY AREA? You don’t even know. Also, Victoria contacted us about this scam. She was contacted by a woman calling herself Helen “a single Mother of two,Helen, they are 6 and 3+ years respectively .I attended California School for the Deaf where I achieved my highest qualification” She is looking for care of her Golden Retriever named Cookie. TDS was contacted by Michele. She had a Care.com account and nearly closed it because she received so many scams through it. She sent us these recent communications with scammers who sent her checks in advance to take care of beagles, golden retrievers, and others. 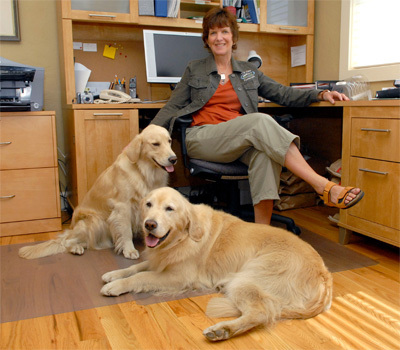 The photo below of the golden retriever and woman seated in the chair was sent by the scammer claiming it was “her and her dog.” We used Tineye.com reverse image lookup to show that the photo was of a woman named Joane Fraser with her dogs. The photo was posted in 2008 on a website called WestCoastCanineLife.com. Many thanks to Michele for sending us all this content! Her hope is that others may avoid being victimized by exposing these scams. And a final footnote… She had fun with the scammers by telling them that the bank told her the checks were fraudulent, then contacted the police, who came to speak with her at the bank. The police, she said, called the FBI and now they all want to skype with the scammer! Text: Morning! I’m Sharon, I need your service as a pet caregiver for my beagles while I work, email me on matlocksharon344@gmail.com for more details. Thank you for your response, I hope you are doing good? I’m really glad to know your interest, I’m sure you will be fine with my pets as they’re very friendly. My babies are two wonderful beagles, they are just a years old, vaccinated to date and very healthy. I’m a Geologist and I travel very often for business. I had someone that usually cares for the babies every time I am not home but she moved to Canada due to some personal reasons, hence the reason I am just looking for the service of a new pet care provider. I’m in need of a pet caregiver starting from 11th of April because I will be arriving on the 10th of April, as I have to continue a project in your area and I will like you to care for my 2 dogs every Monday – Friday from 9am through 3pm either at your place that is if you board pets in your home or in the hotel/apt where I will be staying in your area depending on which is convenient for you,your friends and family can also help I don’t mind as long as they are also pet lovers. I am yet to be lodged in any apartment by my employer but I have already been informed that it is in your area so you have nothing to worry about as you will be the first to know once I have the address. 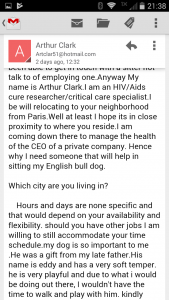 I will need your service for probably more than a month depending on what you are looking for as I plan on employing you permanently and you will be picking my dogs for the walk at my place, after my arrival,you can also pet sit them at my room no problem,I will be paying you $450 a week to care for my pets unless if you want daily or hourly payments. I want to let you know that I am relaxed to having you care for them. I will be making arrangement for Pet Products dogs such as (Dog Bed,Dog Crates, foods etc), I believe that will be of help in taking care of them so you can have some time to look into some other things. Kindly get back to me as soon as possible with your reply so that we will proceed immediately and finalize all arrangements. I look forward to your prompt response. Thanks so much for your understanding and cooperation. Your information has been received and you have been considered for this position. But I need your full name, to be on the pay check. So I will get back to you with where I will be lodging and I will make sure it will not be far away from your home for your convenience so you have nothing to worry about okay. And my babies names are Max and Nikki. 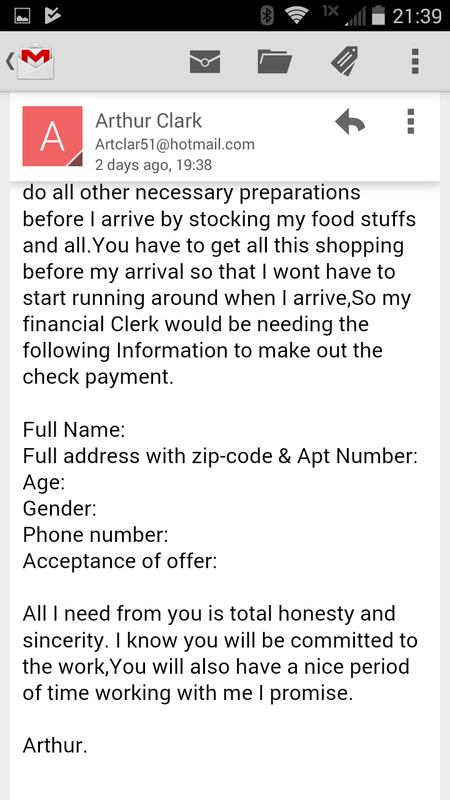 So, as soon as the payment is been mailed to your location and track details will be provided to you as to know the delivery date, and the pay check it will be coming from my employers as my upfront payment so it is to serve as payment for my pets utilities as well as your first week’s fee. I already have a customer who I always get my pet products from and I have told her what my pets need and she has said as soon as she confirms payment she will supply it to the hotel so you have nothing to worry about as the items might even get there before the 7th or 8th of April, I will contact the hotel to pick it up and keep it for me till my arrival on the 10th of April. What I will need you to do once you get the check is that you proceed to your bank and deposit into your Bank Account, hope you have a valid Bank Account? And once it clears on the next day you withdraw the money take your week’s pay and then send the rest of the cash to the pet store owner. All further information will be forwarded to you as soon as you get back to me with the deposit receipt slip for verification once the check is been deposited into your account for clearance. I look forward to your prompt response again. I’d like you to confirm your information below for issuance of payment, I mean doing this for accuracy so that the pay check won’t be in wrong names or sent to a wrong address. My beagles names are Max and Nikki once again, and I am sure my babies will be in the right hands with you huh? Then, the pet store owner information will be provided once you send me the deposit slip. So let me know if you have any further questions before commence with having the check mailed to you as soon as possible. Thanks once more for your cooperation. Kindly reconfirm your names to be writing on Check in my previous message, as to avoid error. The payment will be mailed out to you this week from my employer’s financier and I’ll let you know as soon as it’s sent, so you can know when to look out for it. You’ll be receiving a payment check of $3,850 out of which you will deduct your first week service fee of $450 and send the rest to the supplier for the pet store manager for the delivery of the pet product. I’ll get the supplier information across to you in due time. Also I want you to check your email on a regular basis, I might have updates for you. And here is my official cell phone number 512-430-1557 you can text me anytime. Thanks and God bless you. Sorry for the silence, I had a couple of appointments so I can’t made it to email you yesterday. Your payment check has been processed successfully and should be mail out to you today. So you can be expecting the delivery to your location on Monday or Tuesday but I will send you the track details immediately I have it. And once you receive the check, kindly proceed to your Bank and get it deposited, and you email the deposit receipt slip for confirmation so as to proceed. Here is the fraudulent check sent to Michele. Notice that the name represented on the check has nothing to do with the sender named Sharon. Michele looked up the corporation. They make name badges, nameplates, etc. She also called the Bank and emailed a copy of the check. Text: resume/references to(bakersussy8@gmail.com) for more details. 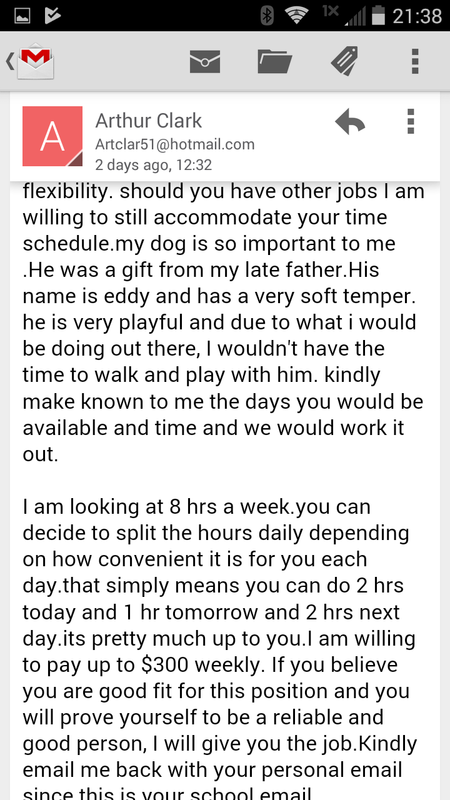 I have made some arrangements with the dog utility suppliers, so as soon as you get the payment, you will deduct your first week pay and have the rest sent to the dog utility suppliers as soon as the check clears, I hope my Dog will have the best of time while is in your care and I hope you will treat him right just like yours, attached is a picture of me kids & cookie. Get back to me as I have a lot of issue to put in place prior to my arrival. I look forward to hearing back from you. 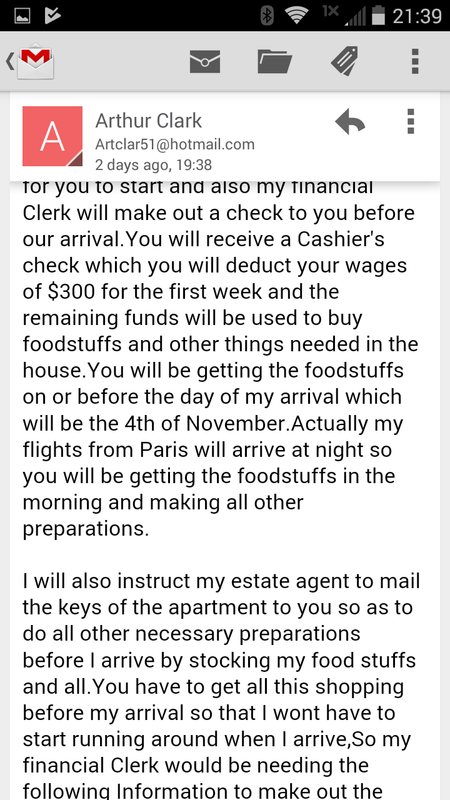 Good morning Michele , I hope you had swell night?thank you for the information and l`m very happy to know you want to care for my pet,The start date is [4th of April],The pay rate is $25/Hour also l will be living in [TDS REMOVED DETAILS] ,and will like to know if we can meet at nearest McDonald to you(3rd of April)we can have a short meeting to conclude on other arrangements and discussion about the pet needs and activities before work commences…..by 6.00PM if that works for you?..Just to make it clear, The check will come in the amount of $2,880.$400 goes for your first week deposit and the balance of $2,480 goes to the dog equipment suppliers on delivery and l will provide you with the suppliers information once the money is available. I await your email as soon as you have received and deposited the check so that I can contact my bank to ensure the funds are released. Good morning Michelle, I hope you had swell night?Kindly ensure to have the check deposited first thing this morning and get back to me once you’re done. Has the check been deposited? Baker Text: I just emailed you with the tracking number of the payment package sent to you and it show it’s been delivered to you and left at your front door. Baker Text: Kindly check your email and proceed with the given instruction. I await your email/text. Mrs.baker. Michele Text: Hi. So sorry it is taking me so long. But I am wanting to know if before this is to happen if we can meet first ? Please understand that I am just being cautious. With the way life is today I have to be careful in knowing that this trustworthy. Can the meeting happen first. And we can go from there. Please understand. I just need to have piece of mind. Thanks again. Baker Text: You should know I’m a reputable woman and I consider my nanny as family and I wouldn’t put you a thousand miles close to anything or situation that could hurt you. 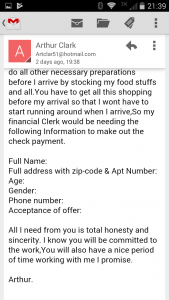 Baker Text: I trust you with the money for the purchase of Dogs utility cause I believe you’re competent and the perfect fit for the job.. It’s only ideal that I included the payment for the items to your check since the items will be delivered to you prior my arrival and I won’t reverse the check. Kindly ensure to have the check deposited. Michele Text: Thanks. But I would feel more comfortable with meeting you first before I commence with the check. Baker Text: I won’t want my son to be stocked and we will need the wheelchair on our arrival. Kindly do this for the sake of my kids and you won’t regret working with me. The dog is meant for my son. Michele Text: I would like to meet your son. But I still need to meet with you before anything happens. Thanks. Baker Text: Good morning ,How is your day going? We will be meeting 6th of April cause we will be needing the wheelchair on our arrival and I won’t want my son to be stocked. Have a wonderful Sunday. Here is the second fraudulent check sent to Michele. Again, notice that the name represented on the check has nothing to do with the sender named Susan. Thanks responding to our email inquiry regards the pet sitting position. My name is Peter Steve my wife’s name is Jennifer with our first daughter Shirley & our dog Blitzen. My wife is 4 month’s pregnant and we are in the process of re-locating from , QUEBEC CANADA to your city. My wife & I are professional Tourist but at her stage of pregnancy, I will prefer she does not work full time. She will be working few hours per week while i do most of the aspect. I will be offering you $350.00 weekly at any convenient time of yours, three times in a week probably Tuesday, Thursday and Saturday to handle the pet sitting position. We will be needing your services for the next seven months if you will be available, hope two/three hours will be enough to take care of blizten in a day, or anytime you are convenient with, you just have to let me know your time schedule as for us to fix a time that won’t be a problem or inconvenient your other daily activities and also you will be helping my wife with running some errands when necessary. Blitzen is wonderful and a very bright, cheerful and clever, sociable, playful, friendly, vigilant, and very loyal, attentive, and calm. Loving around children, and intelligent he does not bark very often, his soft and kind to be around. We have a financier who is helping us with the moving transition. It’s okay if you prefer to sit him in my house or yours as i can drop him at your home every day and will greatly appreciate if you will be delighted to accept this offer as we would be arriving soon; I hope you are fit for the position with full commitment and our location will not be far from you which is the reason why we want to secure a pet sitter before our agent get us a house the Keys and the description of the house will be mailed to you as soon as possible .Also, you will be helping us in purchasing groceries and some dog food for our home complex before or on the day of our arrival. I will be staying in the states for about 7 months with my families and you will be rendering us your services for that duration, if you meet up to our expectation with your services. I will as well like to run a background check on you because i would love to be sure Blitzen will be safe with you and he will be in a safer environment i hope you understand my concerns. 1) What academic qualifications do you possess? 2) Do you have any relevant certificate(s) to back up your pet sitting/dog walking Career? 5) Tell us more about your temperament with animals. TDS was contacted by Natalie who informed us that she had received a check in advance to care for the dog of someone identified as Sarah Cathy <sarahcathy1024@gmail.com>. 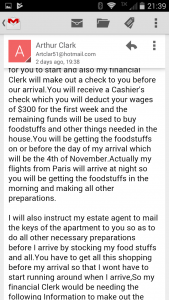 After depositing the check in her account, she soon found our article and realized that the check was fraudulent and she was being scammed. 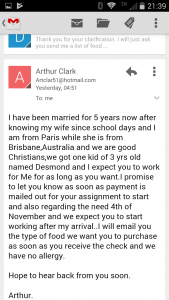 She sent us this recent exchange of emails between she and the scammer…. here is the receipt for the deposited checks. It will probably take a day or two to clear. What are the hours you need me Monday through Thursday? I’m just catching up on emails now. I had to go to the vet today and run a lot of errands. I just looked and the check has cleared. Okay good I want you to pay for the dogs utility and core vaccine today so that it can be deliver to my new apartment by this time of tomorrow I will email you with list of goods you will be expecting to check up on delivery in my new apartment. Are you with your Debit card? Yes, I have a debit card. Okay I will get back to you in a bit with the information you are to transfer the money to as soon I concludes with her . Who is it that is receiving the money? Ok, but I’m not a nanny. I just agreed to watching the two dogs. Will you be at your apartment tomorrow to receive the dog supplies? Then I should have them delivered here to my place, wouldn’t that be simpler? You’re to locate two different Moneygram money transfer outlet with your debit card and send it to the supplier of the Dogs utility with the below information. Name: Melissa Yanez Gonzalez , City: Anaheim , State : California , Zip Code : 92801 .This all the information you need to transfer the funds. You are to send the money $1100 and another $1200 in two different Moneygram location respectively, Kindly deduct your first week salary and use the remaining funds for sending fee. Kindly get back to me with the references number and the receipts of the two transactions. You have to split the funds so that there will be no hold on the money. I just concluded with my realtor he told me they will pack out from the house . The house aint for sale but for ren. Just follow my instructions and everything will turn out fine at the end. The house has a for sale sign on it and is listed on a realty site. I will iron the issue out proceed to make the payment so far the goods will be deliver to your house. Thank you. Natalie never completed the transaction. After investigating online, she realized it was a scam. We urged her to contact the Anaheim, CA police and explain the scam, hoping that they would see who came to pick up the moneygrams. 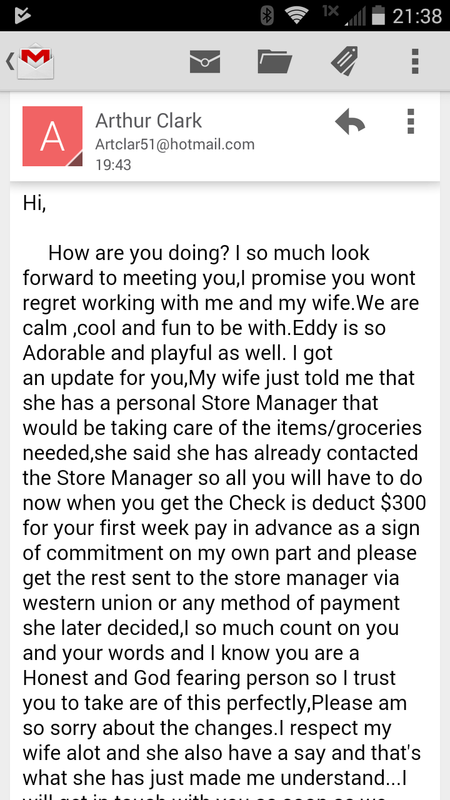 Sadly, they turned her down and these scammers are free to continue preying on others. The Daily Scam was recently contacted by a woman named Morgan to let our readers know that the scammers who were targeting Care.com members offering child-care services have now begun to target Care.com members who offer dog-care services. Let’s hope this means that the scammers are having a harder time convincing their potential child-care victims of their scams. Morgan, thank you! And to the many Care.com members who have contacted us with their stories… Keep them coming! The more all of you share your stories online, the more we can reduce the success of these fraudsters targeting folks on Care.com. By the way…. 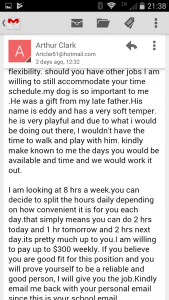 Petsit.com has also posted a page of these type of scams targeting pet sitters. Check it out on their website. 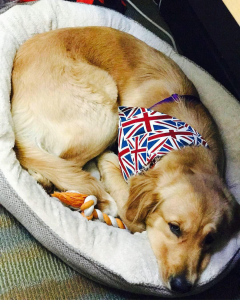 In May of 2014 one of the scammers also talked about his dog named ‘Blitzen.’ Coincidence? We doubt it! Dear TDS Readers, this scam is still ongoing. We’ve heard from a few people through fall and winter 2017-2018. 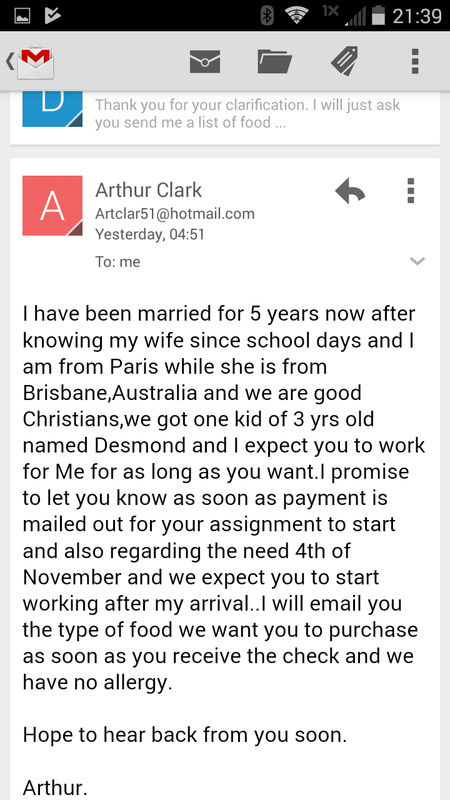 Here’s another example from Mark who heard from a woman using this Yahoo email address: swddev@yahoo.com. Here are the emails he shared with us. They contain soooo many red flags! Hello,How are you doing?thanks so much for contacting me,I am looking for a PET SITTER for my adorable dog..well i want you to know that i dont get on facebook that much because my job keeps me so busy..IF you are really interested..For more details,kindly email me to..
..my Rocky is good with kids and other animals…his well trained and has no disease..potty trained and his shot is complete..Rocky is a year old..(you will sit my Rocky for 2weeks at your flexible time and hours…3days in a week).i have the option of dropping him at your house or you coming for him at my place Either ways works fine with me..$400 weekly…tell me more about yourself..
Where do you live?Where are you located? please answer my questions . Well…This could be a temporary/permanent job. It depends on what your schedule looks..i will like you to care for my Dog..Am Out of town at the moment for Work..I will be meeting with you immediately when I arrive with my Dog..I will be back in few weeks..You will have to walk and sit my dog for 2weeks..at your flexible time and hour..your first week advance upfront payment will be mail to you..(cashier check)..I just want to inform you that i will issue payment to you which will cover your money and my Dog utility supplier funds.$400 for your first week upfront payment and the rest for my dog utility supplier..I have contacted a supplier for the dog Cage, toys, blankets,food,bed.and other things that’s will care for my Dog..Are you sure you can care for my Dog?I just want to make sure Rocky is fine.he has no allergies..